Specifically, 2 Chainz dropped in to discuss his cookbook, new album and New York’s controversial “stop and frisk” policy. The lead single from “B.O.A.T.S. 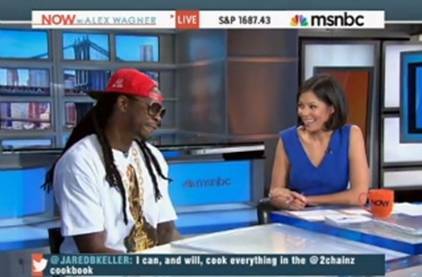 II: Me Time” is the single “Feds Watching.” So host Alex Wagner took the opportunity to ask Chainz for his opinion on surveillance issues in the minority community. Ultimately, he added, “I just try to entertain without boring” the audience, and he prefers to educate listeners in more subtle ways. “They might dance and party to some of my music but it still may have an underlying meaning or substance involved,” he said.